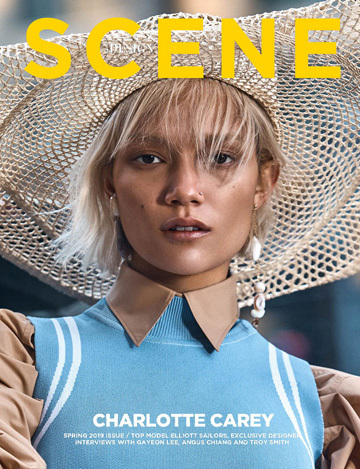 SOPHIE MILNER considers the rise of the Insta-famous and questions how models “earn their stripes” in today’s fashion industry for D’SCENE Magazine‘s Summer 2015 issue. In today’s modelling game, you’re only as good as how many followers you have on social media. That was the gist of a story in Forbes from late 2014 – and most models would agree. Check your smartphone to see how the new generation of successful models has reached celebrity status, with millions of followers desperate to know their every move. They’ll tweet what they had for breakfast, snap a selfie from a night out with their celebrity BFFs, and chat over Twitter with Rihanna about how funny it was when she jumped off that yacht off the Caribbean coast. The tech-savvy beautiful faces of the 21st century are breaking down the doors into the elite of fashion and making names for themselves. Take Kendall Jenner, the kid sister of another media phenomenon Kim Kardashian. Her catwalk breakthrough saw her walking for Chanel, Dolce & Gabanna, Emilio Pucci and Valentino. It felt like the end but also the beginning of the fashion phenomenon of celebrity models. But for every catwalk she graced and every campaign she secured, she was met with a backlash questioning her modelling credentials. Recently, Naomi Campbell condemned the new wave of Insta-models for not properly “earning their stripes” in the same way that she and the other supers did back in the 1990s. She said it will be “easy come, easy go” for models who gained success through social media. But racking up a staggering 34 million followers across Twitter, Instagram, and Facebook is more than enough validation for Kendall’s success and certainly gives her a hefty numerical fanbase. The rookie model also managed to land herself the holy grail of modeling contracts with Estee Lauder, mainly because the brand had openly voiced that it wanted to reach a younger, more digital savvy customer. So who better to sign than model-of-the-moment and a digital native? The contract paid off. Within 48 hours of Kendall posting an image of the campaign on Instagram, 90 per cent of visitors to the Estee Lauder site were first-timers, 71 per cent viewing the site on a mobile device. This new wave of digital-age models are changing the dynamic. To make an impact in a campaign you’ve got to be relevant, and with the digital world merging more seamlessly with the real world, you cannot be relevant without a digital following. Name recognition has always been a powerful asset in a model’s career. But in the past the public mostly got to know the fashion industry’s biggest players through countless covers, campaigns, gossip columns and paparazzi photos. Now, today’s social media has enabled models to make names for themselves. Social media has allowed the velvet ropes surrounding the fashion industry to open. Fans now have an almost access-all-areas pass into the lives of the beautiful and famous. Models are no longer just images on a page or in a campaign, but they are real women with real lives and personalities. Showing their personalities can tip the balance between who makes it big or not. Fans and audiences have a glimpse of who is friends with who, suddenly creating a transparency. You can watch all the action from the sidelines. Cara Delevingne – who just so happens to be one of Kendall Jenner’s best friends – also has social media to thank to her fame found from modeling. With 18 million Instagram followers and another 2.2 million on Twitter, she’s another big player in modeling’s new social-digital scene. Although social media didn’t start her modeling career (Delevigne was in her first Vogue shoot at the age of 10), it certainly helped fuel it. What makes her so popular with brands as well as audiences is that she uses social media to showcase her quirky personality. Her funny, unique, and often dorky attitude makes her achievements seem achievable. It seems legitimate to think that she might not be quite so popular if her go-to photo face for Instagram was a steely glare or blasé pout. Instead, she offers up an unusual contribution of ludicrous gurns with her eyes crossed so sharply they might fall out of their sockets. Why is this quite so appealing? Surely fashion is about selling an image of beauty? But there is something somewhat endearing about a woman who can switch from being beautiful to bizarre in an instant. Plus, this goofiness brings her down to her target 15-20-something audience level: it’s like seeing your best friend glammed up before a night out, then seeing her again the next morning looking the worse for wear as she struggles to keep down her eggs royale at brunch. What separates Cara and Kendall however, is their polar opposite pedigrees. While Cara, the undisputed igniter of the insta it-girls, comes from an upper class British background, Kendall comes from reality TV royalty, the Kardashian clan. It’s not new to accept rock star’s daughters, like Georgia May Jagger, or certified Sloane’s like Suki Waterhouse into the world of modeling. These women have been cultivated and nurtured into the British fashion scene. But the success of models such as Kendall, who rose to fame starring in reality TV show Keeping Up With the Kardashians, represents a real shift in high fashion, an area that has always been so elitist. Unashamedly, fashion loves taking something uncool and making it cool. Walk around Shoreditch and witness the throng of 20-something women wearing spice-girl-esque platforms and pink faux-fur coats. What Kendall’s success shows is that social media is giving a platform for anyone to be a model, providing you have plenty of followers and sharp enough cheekbones. The new social-digital landscape is also giving power back to the models in terms of their own media portrayals. The supers of the 90s were reported on through newspapers, gossip columns and paparazzi pictures. They had no control over what was written. Of course there is still very little control over what models of today can do, but they can certainly combat it by creating their own personal media profile shaped exactly how they want it. Name recognition has always been a powerful asset in a model’s career. But in the past the public mostly got to know the fashion industry’s biggest players through countless covers, campaigns, gossip columns and paparazzi photos. Now, today’s social media has enabled models to make names for themselves. Despite all of the criticism the models have faced for this so-called “easier” route into the industry, nobody can deny that this social-media movement has put models back on the covers of magazines, rather than celebrities. Of course with social media creating a platform for models to promote themselves through, it also creates a global arena of millions of new faces for modelling agencies to search through to find the next big thing. The days of being discovered waiting for a plane at the airport (Kate Moss) or eating in McDonalds (Gisele Bundchen) are limited in light of new digital casting systems that work through social media channels like Instagram. Brands like ASOS and Marc by Marc Jacobs have used the social platform to find faces for campaigns, and now, modelling agency giant IMG has launched a similar social casting through its new account We Love Your Genes. I heard mirror #Selfies are still a thing right? ? It’s embarrassing to go through any rebellious stage in front of people that you love and respect, and yet I’m glad I did. Starting late December, the We Love Your Genes account encourages aspiring models of the Instagram world to tag their photos with #WLYG for the chance to be scouted. According to IMG, one of the major reasons for taking to the social network to find the freshest faces is so that they can look at users Instagram profiles as a digital portfolio to get a sense of their “whole personality.” The transparency created by social media has created a need for models to be so much more than just a pretty face. If you can’t walk and talk, then the modelling game is no place for you. Social media has opened the back door to the industry not only for wannabe models, but also for spectators and fans that want a glimpse into the lives of the fashion elite. The success of the new breed of Insta-Girls has challenged a world of culture snobs. Models are no longer just cover stars: with every behind-the-scenes campaign shot or every goofy mirror selfie, they become the superior cool kids we stare at when they enter the canteen and our best mates sitting right next to us all at once. With Instagram being recorded as the fastest growing social network, it can’t be too long before the velvet ropes disappear entirely. Thank you for 200k followers❤️❤️❤️ Here’s a little hello from Italy! ?? #WokeUpLikeThis? With almost 30 models featured in the new issue of D’SCENE few of them have passed half a million mark on the Insta follower counters. See below (and above) top 5 most followed D’SCENE Summer 2016 models. Top model River Viiperi was photographed for D’SCENE Magazine by Igor Cvoro with styling from Emily, river wears pieces from Armani, Brioni and Ports 1961.